Recently director Balki organized a function in Mumbai to celebrate Ilayaraja scoring music for 1000 films which was attended by Rajinikanth, Amitabh Bachchan, Kamal Haasan, and Dhanush besides numerous celebrities. Director Balki invited Dhanush to speak at the occasion and also sing Raja sir’s songs when he added, “Dhanush prides himself on having a voice very similar to Raja sir and Raja sir is going to decide whether it is true or not”. A visibly nervous Dhanush came on stage with a debonair suit and said, “Sir, naan sathyama appadi ellam sollalae (Honestly, I never said these things)”. 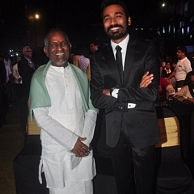 When Ilayaraja questioned Dhanush on this, the Aadukalam hero got all the more nervous and said, “As it is I am nervous and you are making me all the more nervous”. After this touching speech, Dhanush went on to sing Naan Thedum Sevvandhi Poovidhu from Dharma Pathini and Then Paandi Seemaiyilae from Naayagan. The striking similarity of Dhanush’s voice with Raja sir’s voice could never be denied and the sharp intonations and flexion in Dhanush’s voice reiterate that the actor can give any trained singer a tough competition. And this was emphasized when Raja said, "Dhanush, you sing better than me”. Incidentally, in a career spanning 15 years and 25 released films, Dhanush had just worked in one film Adhu Oru Kana Kaalam scored by Ilayaraja. With his adulation for the legend and his musical talent, will the duo come together again in a film? That would indeed be magical. Let’s hope and wish! When is Uttama Villain releasing ? After Thala, it's Jai ! Can Obama make it for Rahman in the last minute? One movie that impressed both Vijay and A R Murugadoss ! Another postponement in Yennai Arindhaal's release? People looking for online information on Balki, Dhanush, Ilayaraja, Ilayarajas 1000 film will find this news story useful.